It took up the better part of our weekend, but we got the boys a new bed, mattresses, and sheets and set up their bedroom. We are slowly getting used to the new beds. M is scared to be up that high, but is adjusting. So far (after the first night anyway) it has worked at getting E to sleep through the night! Hooray, 2 nights in a row now, pretty much since birth! We had to eliminate a dresser, get some bins and a bookshelf, and hang some hooks, but I think it will work. I just can't believe how small their room looks now! On Monday, after the bed errands were done, we had our 4th monthly disney party at my parents. We ate fish & chips & smores and watched Peter Pan. This is a group shot of us "being pirates" If you look close, you can see my dad has donned an earring for the occasion. Also, I just want to say that my last post referred primarily to people having a normal, low-risk pregnancy. I cannot stress enough how grateful I am that we have doctors and hospitals for people at risk, with problems, sick, etc... Many of my friends and family have been saved by the life-saving technology and expertise found at hospitals. In the documentary I mentioned, the producer, who planned a homebirth, had a c-section and a premature baby in the end, so it doesn't just show the one side, and I'm sorry if I discounted the importance of birth interventions for those who need them. Thanks for the support everyone! (and for the record, I don't think I would ever QUIT blogging altogether) I guess I am just tired of trying to make everyone feel comfortable, but you're right, it's MY blog, so today I'm going post something that I feel pretty strongly about. Since before I decided to try to conceive, I started researching my options for childbirth and all that accompanies. There ARE options out there. I read Thinking Woman's Guide to a Better Birth, Spiritual Midwifery, a bunch of Dr. Sears, and many other more mainstream childbirth/pregnancy books. I read I think I was too young/frightened of approval/unsure of myself to decide to do what I wanted to do, and as a result I had a pretty traumatic (to me) first birth. Mistakenly, I believe, many people think that the only thing that matters when a child is born is their health/lack of "problems". While I am TRULY grateful for the birth of two very healthy boys, that is not all that matters. To say this is selfish is to really discount the consequences of a major life experience. Having a child is a life changing experience. It changes you no matter how it is done. It can be frightening/scarring/traumatic or it can be empowering/beautiful/peaceful. Of course there are in-betweens on that spectrum as well, which is what I consider the birth of E to be. The point is, a woman will always remember (even if the memories are perceived) the way she was treated when birthing. This is a memory/feeling/mood that relationships and future experiences with birth, with the child, with many things will cast in. I feared birth the second time around, and the book Birthing from Within and Ina Mae's Guide to Childbirth helped heal some of those scars and so I could move on to have a better experience the second time around. I don't know when I will choose to have another children/child at this point, but I do know that I have made the choice to have a normal, peaceful birth at home. (I am not saying OB's are bad/stupid, but they are the product of many years of conditioning by a country hell-bent on making money above all else) I just want people to at the very least look into their options and decide for themselves what they want to be their life-altering experience. I would HIGHLY recommend seeing the documentary "The Business of Being Born" (directed by Abby Epstein) which delves into these very issues and uncovers some pretty crazy statistics about the poor death rates/health of our country's birthing situation. Since I had read a lot on the subject, not much of it was a surprise to me, but I think it would be to some. It is not scary to give birth without drugs, and it is not unsafe to give birth at home. What is scary is the unnecessary interventions (and accompanying "complications") you will have at the hospital if you don't educate yourself and have the confidence/support to act in your own best interest. Do it. I feel like I don't have anything to blog about. I have for some reason gotten really self-conscious of what people are reading vs. what I meant to write, kwim? I have been really busy lately though. We spent another fun-filled (not) day at Primary Children's this week with E. (See DH's blog) I went to an assembly that my brother was in charge of (he's Sr. Class Pres. @ Davis) today and he did a good job, it was funny. We went to the Aviary earlier this week with Grandma. My sis. moved to SLC and we've been to see her apartment. Playgroup at the Fire Station today. Tonight we watched 5 boys for our date night co-op. You know, the usual mommy stuff. Also, I am on a search for a new pair of glasses, (My eyes have continued to worsen) but can't find anything I like and have checked like 10 places. I think I'm just REALLY out of style all the time with my taste. A salesperson today told me that my current glasses are totally wrong for my face. So apparently I look bad all the time and know nothing. It's frustrating and I wish I wasn't getting so increasingly blind and didn't have to wear glasses. The birds represent me, M (blue), and E (red) The boys helped a bit and were really proud to be "featured" on the bag. Also, my son has reached his I'm-almost-4-and-I'm-such-a-dork stage. Check out the outfit he put together this morning (5 minutes before we needed to be out the door) I am changing from mom-who-encourages-child's-creativity-by-letting-them-dress-and-express-themselves to mom-who's-child-has-gotten-so-creative-it's-bordering-on-inappropriate-and-so-censoring-is-in-order mom. Happy 18th Birthday Aunty And! Yesterday, our dear Aunty And finally turned 18! We are so happy for her that she can finally vote, it's been driving her crazy for years. We were having dessert, banana-nutella wontons. Here are me and my boys on Mother's Day. It was a great day. M made me a beautiful sand art piece, E gave me a new version of Photoshop, and the DH gave me mulch in my flower beds/garden. Thanks guys! If I had stuck to my program, I would have just paid off my "loan" a year ago, having taught in Utah for 4 years to "pay back" my education. As it was, I ended up paying the old-fashioned way, with money, thanks to some helpers to whom I will be forever indebted. I don't know that I even want to be a Social Studies Secondary Ed. teacher anymore, now that I am actually a little older and know what my interests actually are (I chose my career at 16 or 17 and was locked in) Don't really know what I want to be when I "grow up," but right now I'm a mom, and that's enough for the time being. 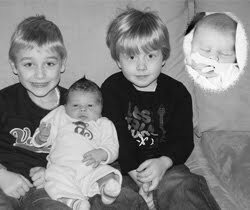 In short, it's been a crazy last 5 years, and having boys that are 3 and 2 is insane sometimes, but I wouldn't trade it for the world. For more exciting news, check out the recent purchase on my DH's blog. Also, we had a great Day away from the kids for the first time ever! I surprised DH and we went to the Melting Pot and a nearby hotel in SLC. We got to actually sleep in! (except for housekeeping knocking every 20 minutes all morning) It was nice to just veg and not have to worry about getting kids to bed for once. A big thanks to Grandma and Grandpa for doing that for us!